Somewhat to my surprise, I managed to survive last winter without a car. However, I decided to acquire some wheels for the warmer months. By that I mean 2 wheels, as in a bike, for mobility with the benefit of exercise. Given the short warm season, I figured I’d pick up a cheap one at the bike auction. 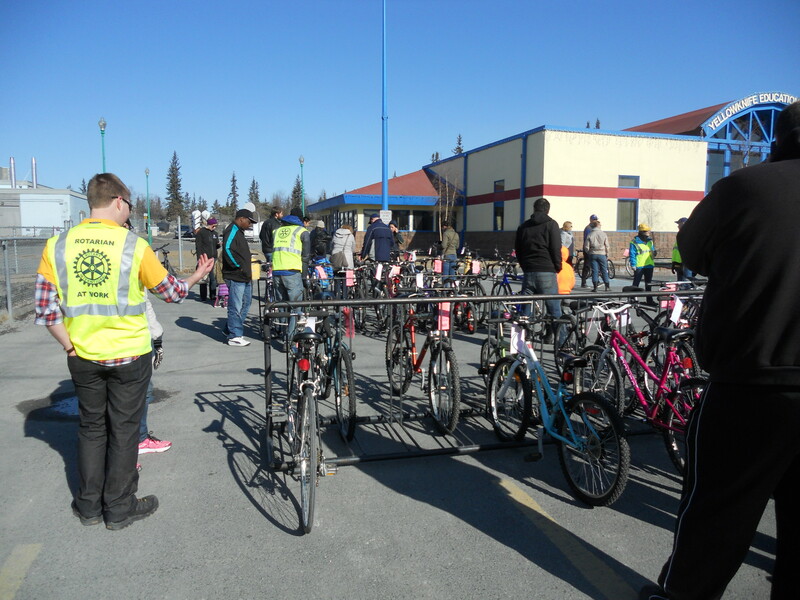 Evidently bikes are frequently stolen in Yellowknife, and many that the RCMP recovers remain unclaimed. 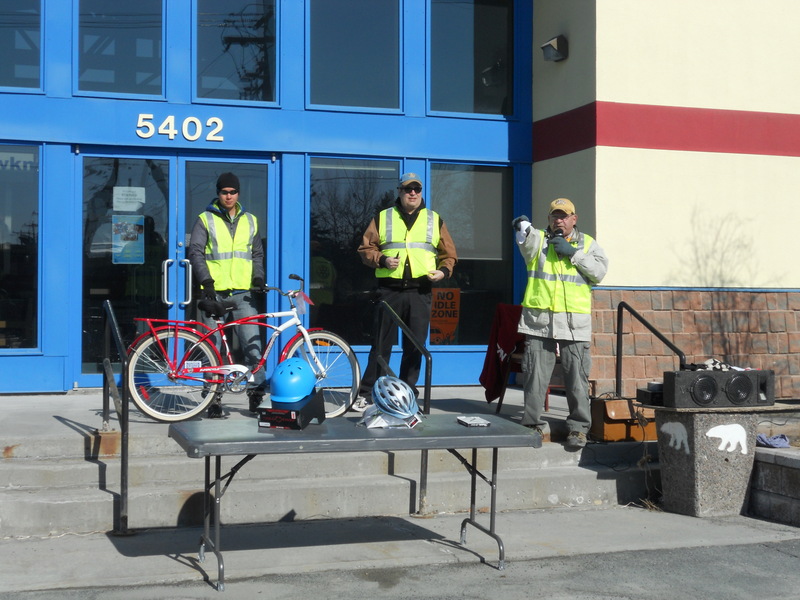 After some time has elapsed, they pass them on to the Rotary Club, which spruces them up enough to be roadworthy, then raises funds with a Spring bike auction. The auction was held on a sunny but chilly Saturday morning this month, in the car park of YK1 school district. Bikes were on display for about an hour before the bidding started. They were in various conditions and sizes: some practically new, others very well-used, some for adults, some for kids. There was a good turnout of potential buyers, and the Rotary volunteers and the acutioneer kept things moving along at a good clip. It was amusing to see excited children running up to collect their bikes after their parents won the bid. A kid on a bike is always a happy kid. Other buyers outbid me for my 1st and 2nd choices, with bidding for the former getting so hot that it went for more than the cost of a new bike. I consoled myself that my 3rd-choice was an older bike, so there’d be less competition and it probably would not be stolen. By the time it was up on the block, the crowd had thinned significantly, yet there was still one tenacious other bidder, whom I managed to outbid by $5. I didn’t own a bike in Toronto because drivers there are always in a rush, and I didn’t think it was a good idea for a flimsy bike to compete with tonnes of speeding metal commandeered with impatience, often mixed with distraction. One morning I passed by the scene of an accident that had just occurred and witnessed a cyclist lying dead in the road, which further cemented that notion. But in Yellowknife the speed limit is low and nobody’s in a hurry, so I figure the risk of meeting a similar fate is much lower. I hadn’t ridden a bike in years, but you know the saying:”It’s like riding a bike; you never forget”. I can testify that it’s true, because after my successful bid I jumped onto my silver bullet and found my bike legs in less than 10 seconds. The only trouble was that you get what you pay for, so if you pay cheap for a bike, you get a cheap bike. I wanted to be able to carry things on my bike, and this one had no rack. It was in decent condition but the saddle was very narrow and extremely hard. A test ride in the car park wasn’t the same as riding on Yellowknife roads, which are fairly bumpy, especially when the season is changing. After a few trips where I felt every crack and bump in the road, I headed to Canadian Tire in search of a new saddle and an add-on rack. There I discovered the bike that I really wanted: an old-fashioned Schwinn cruiser, purple with whitewall tyres, a full saddle (with much-needed shock-absorbers) and a built-in rack. It was a real girlie-bike if ever there were one, so very girlie that I doubt anybody would want to steal it. 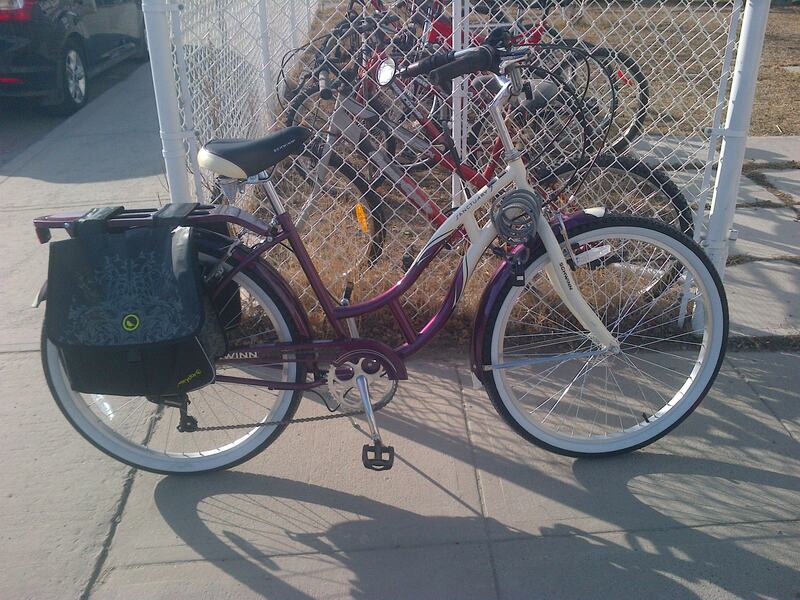 Long story short, I ordered it, posted my auction bike in the classifieds on YK Trader, and within 4 days it was gone and I was cruising around on my purple rocket with groceries in tow, as happily as a kid. The moral of the story: sometimes, getting exactly what you want can save your behind. This time of year is the season for birch syrup, which is the maple syrup of the north. Maple trees don’t occur naturally this far north, but birch trees are aplenty. My friend Blake collects birch sap to make the syrup, so to satisfy my curiosity about the process, one sunny Sunday afternoon I accompanied him on one of his many sap-collecting trips. We didn’t have to venture too far into the bush before we came across a stand of birch, many of them with buckets hanging from their trunks. It was such an odd sight for the middle of nowhere that it felt like a scene from a sci-fi movie: all of those buckets with tubes running into them looked like alien hatching-pods. 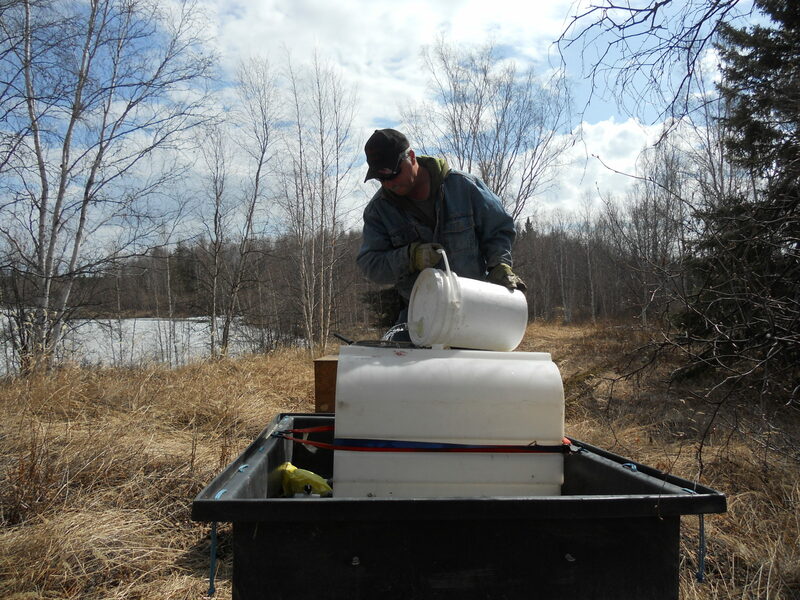 Birch sap can be collected only during a very short period of time in the Spring. This is before the leaves have formed, when the trees are taking in lots of water in order to sprout leaves. Plastic tubes or spouts are inserted into the tree trunks, and it’s remakable how fast the sap drips, which is even more evident when you remove the bucket to empty it. 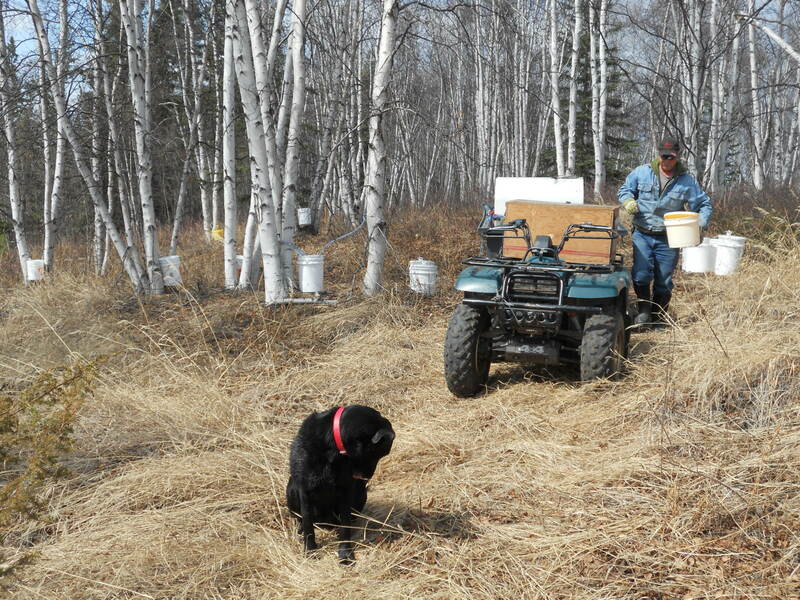 The sap doesn’t stay fresh for very long, so it must be collected within a day or so. 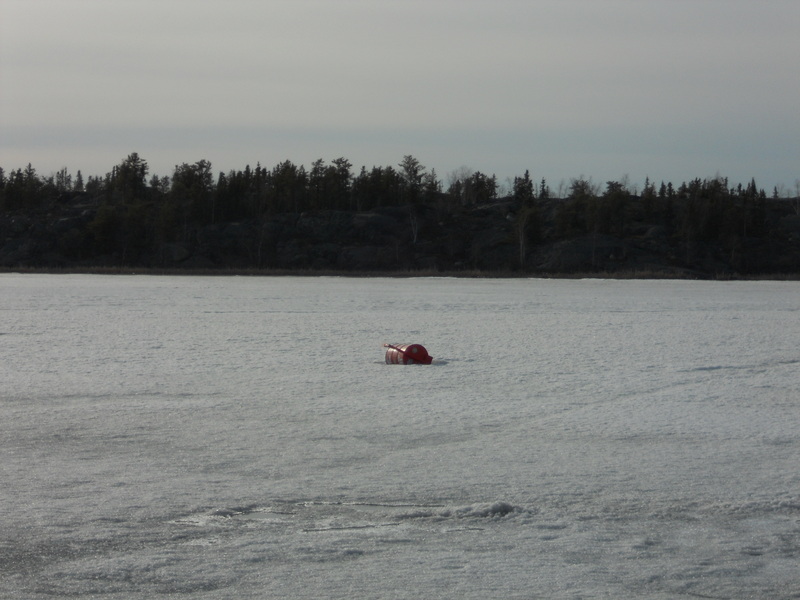 I figure that all of those buckets of slightly sweet water might be temptation to a bear coming out of hibernation. But none of them was disturbed. I suppose there’s more than enough water thawed out on the ground and the sap isn’t very sweet. It was quite peaceful, as it always is out in the bush. Barring the whine of the mosquitoes, which disappeared once I got out into the sunshine, I didn’t hear a sound, not even a bird singing. The last site was on a hill close to the road to Dettah, where Blake also runs a culture camp for school kids. Onsite were a teepee, tents, some furniture etc. 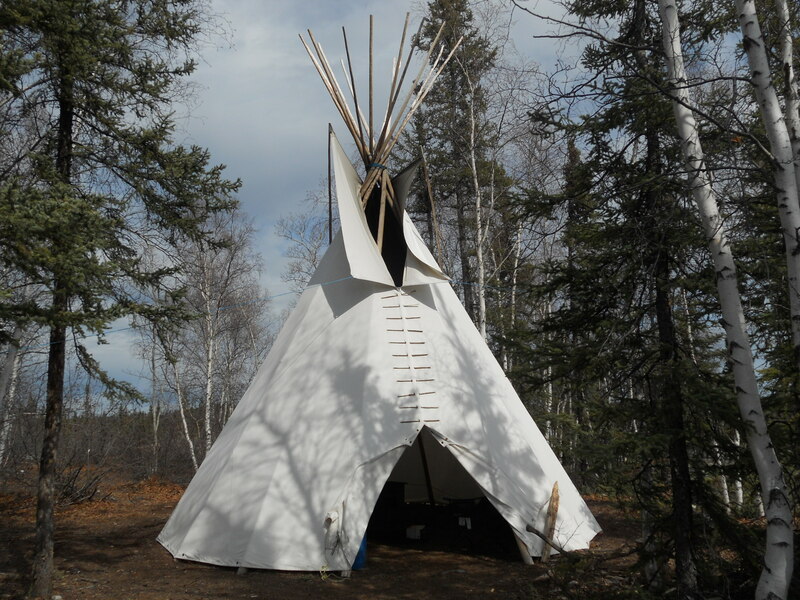 It was a nice-looking teepee, fragrant with spruce and spacious on the inside, the kind of lodging that I might actually consider spending a night or two in, during the summer, of course. 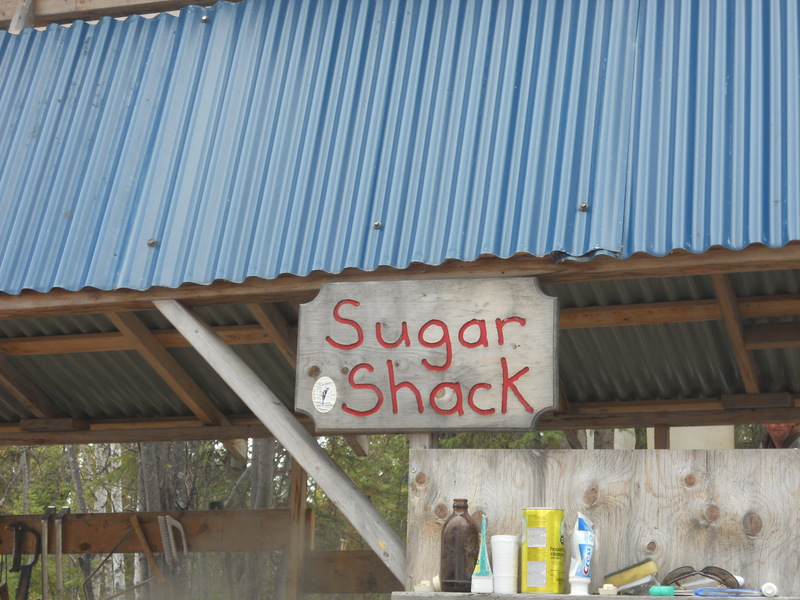 It was almost 4pm when with sap collected, we headed to the Sugar Shack, i.e. the processing plant, so to speak. It was literally a clearing in the bush off the Ingraham Trail. If I didn’t know better, I’d have thought that we were going to a moonshine operation. There are such things as birch beer and birch wine, but here it was all about birch syrup, and the people running it seemed to be camped out there for the duration of the season. They also tapped trees for sap, an estimated 300-400 of them. 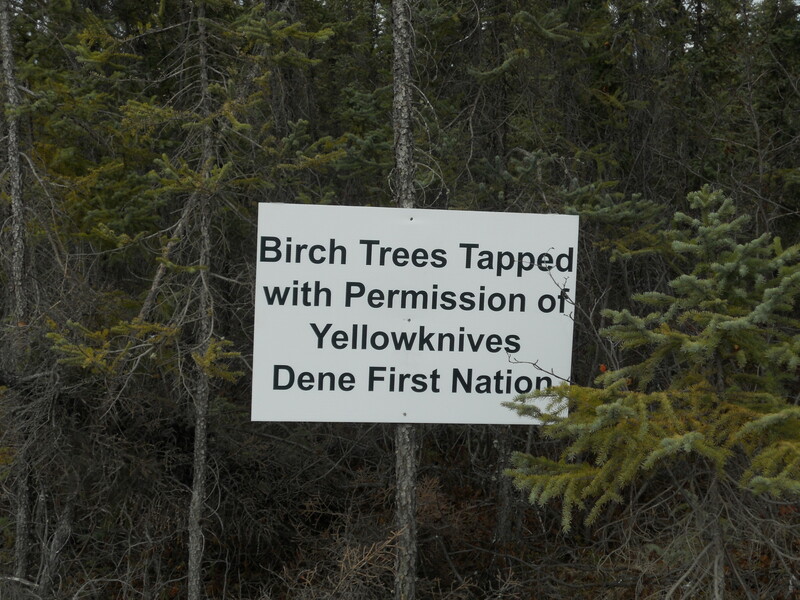 They had to get permission to set up there, as the land belongs to the Yellowknives Dene nation. There were all kinds of tanks, vats, boilers and tubes involved, which were variously bubbling, evaporating, taking in, storing or issuing liquid, which ranged from water to dark brown syrup. 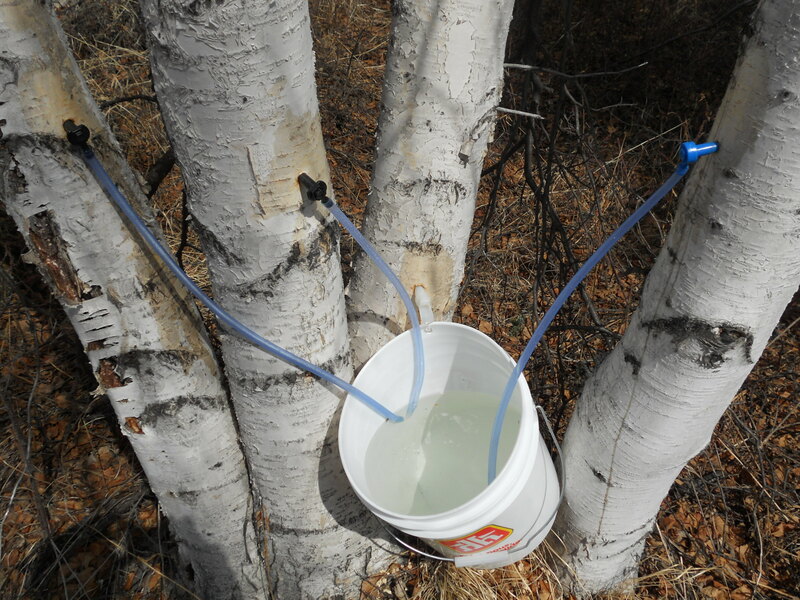 Birch sap is about 1% sugar, so water is the first by-product, for which there was a storage tank on site. So the camp was self-sustaining for water supply, quite an efficient, environmentally-friendly operation when you think about it. With such a low sugar content, it takes about 100 litres of sap to make 1 litre of syrup. 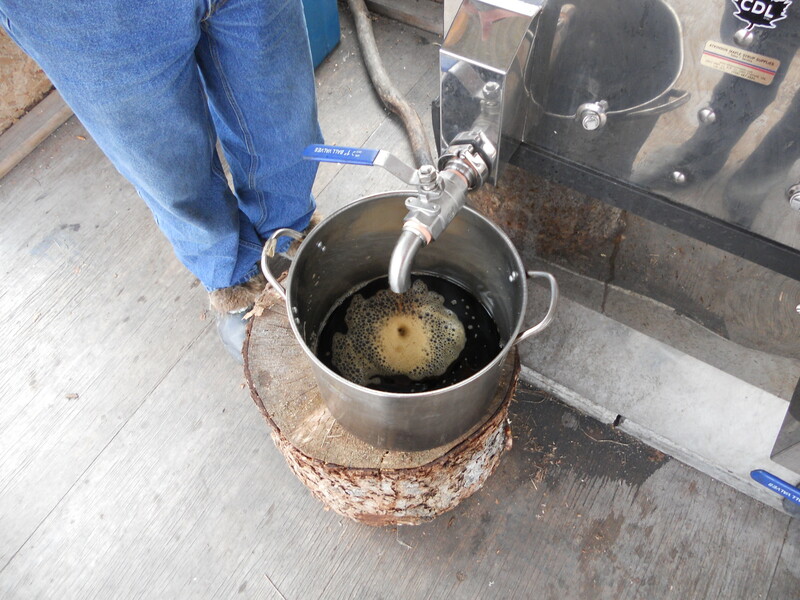 By comparison, maple sap is much higher in sugar, so it requires about half that for a litre of maple syrup. 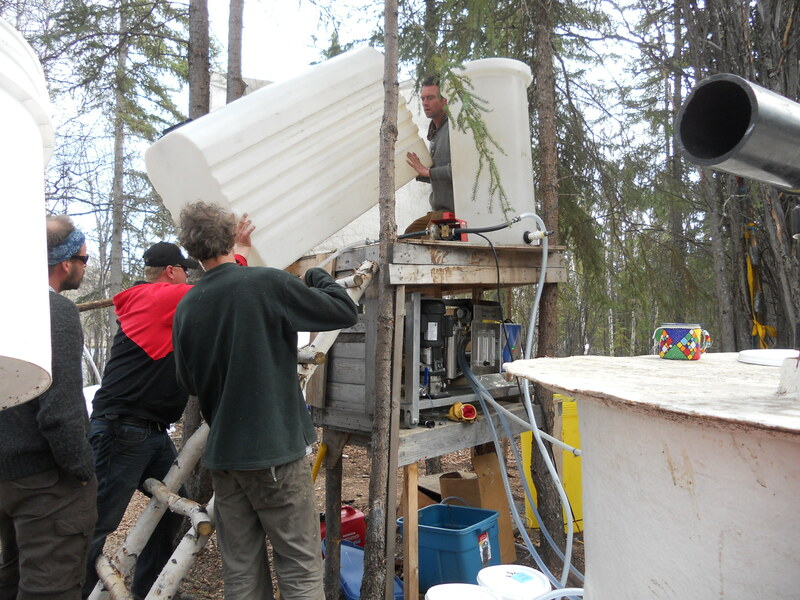 The 60 gallons of sap that “we” had collected would end up producing only about 2 litres of syrup, a lot of work for so low a yield. But it wasn’t all work out there. That day happened to be the day of the Open House for the Sugar Shack, so although we had arrived at the tail end of it, there were lots of people milling around, some roasting food over a fire, others making fried apple slices, which were devoured after being garnished with birch syrup or birch butter. I’d never have thought to coat slices of apple in batter and fry them, but I tried some and they were scrumptious, even without condiments. It was a sweet finish to a very relaxing Sunday afternoon.